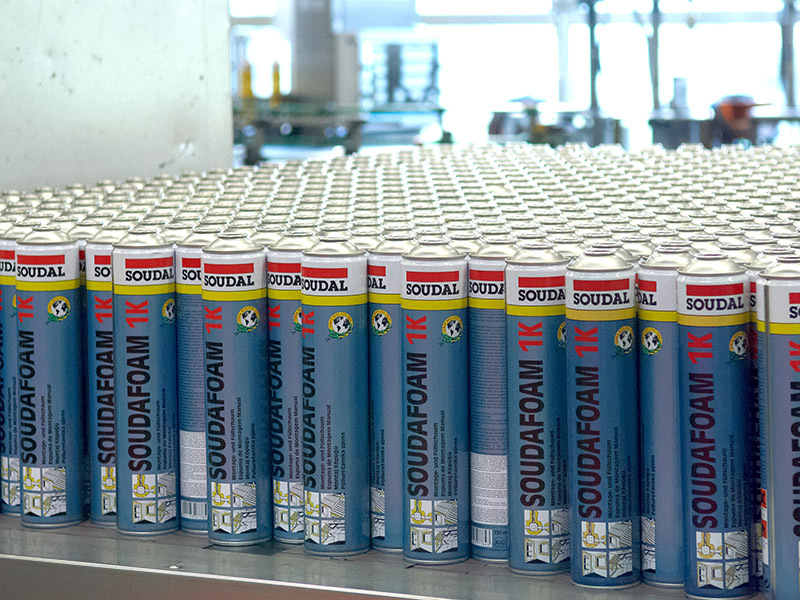 The Soudal Group manufactures products for its own brands and private labels covering 7 groups: silicones and other sealants, polyurethane foams, adhesives, hybrid polymers, technical aerosols and chemical building products. Soudal offers more than 25 different types of silicon, which can be used in a great variety of specialised markets, and has more than 100 different colours in stock. Construction and polyurethane foams in aerosol canisters are made in the world's largest polyurethane foam facility in Turnhout as well as in ultramodern production sites in Poland, Slovenia and China. Hybrid polymer sealants and adhesives are based on the most advanced sealant and adhesive technology in the world. The adhesives and various sealants are solutions based on water, polyurethane or solvents for industrial and construction applications in all types of packaging (from 3ml tubes to 100L cubitainers). Since 2008, Soudal is offering a wide range of technical aerosols for automotive, cycling and many other applications. These aerosols are produced by its subsidiary Aerotrim. It currently also offers a range of chemical construction products, such as concrete additives and liquid membranes. During the first few years, the private labels created the majority of Soudal's turnover. In the meantime a lot of effort was put into the expansion of a Soudal brand. The private labels are maintained to optimise the existing production capacity. During the last ten years, Soudal has been able to properly embed the Soudal brand, through the support of its international sales network, and to offer an increasing range of technically innovative products and become a real marketer of products. In 2017, approximately 70% of the turnover was achieved with the Soudal brand. Soudal aims to further develop into a marketer of solutions by offering more custom-made solutions, such as entire system solutions for airtightness and insulation. The increasing attention to sustainability and the associated statutory obligations with regard to energy efficiency offer great opportunities for innovation. The Soudal brand is the focal point for market innovation and advanced solutions! The Soudal culture creates an environment which stimulates innovation. The business culture of entrepreneurship promotes a suitable atmosphere: innovation is a cooperative activity requiring interaction and cooperation between the departments of technological development, manufacturing, marketing and others within the company. Soudal is continuously investing in research and development, even in difficult economic times. In 2011, Soudal officially opened a brand new state-of-the-art R&D centre at its head office in Belgium, where more than 35 R&D employees are based. Soudal remains competitive by optimising and improving the production facilities and methods based on custom-made systems. In 2009, Soudal engineers developed a batch-in-batch mixing system for sealants. This guarantees optimum quality and avoids the presence of residual substances in the mixing process. 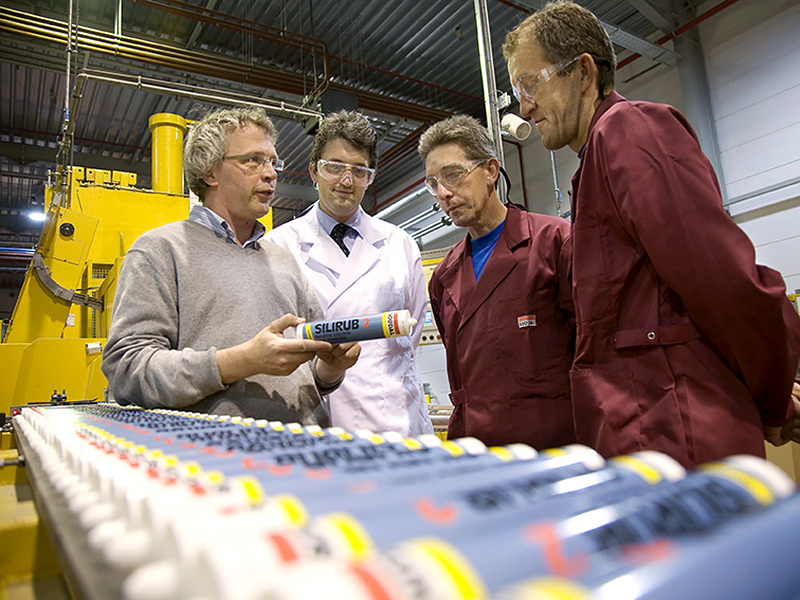 In 2011, Soudal developed a new filling system for cartridges, the fastest of its kind. This has set a new benchmark for the automatic filling of tubes, which will undoubtedly become the norm for the future. Soudal must reinvent itself on a daily basis to be able to face up to all forms of competition: competition from substitute products, competition from newcomers, competition from rivals, competition from the power of suppliers and of customers. Operational responsiveness is a critical factor for success. Our simple structure and dedicated staff are in perfect harmony with the strategic vision of Soudal and the competitive dynamics in the sector. Soudal has developed an organisation, which is able to respond to any changes in a continuously innovating and competitive market.